I don't get it. I'm not being silly. But really, I don't understand how two little kids can get so dirty and stinky in a single football practice. Yes, I know that it is hot outside. So I know that they will get hot. And, they are boys, so dirt is a given. Still, I never would have guessed that their football gear could be such an affront to my senses. YIKES! With this laundry, I know that I need a superpowerful combination of stain fighter and whitener in an easy to use method. Recently I was able to test some Tide Pods and I've been pleased with the results. First, the Tide Pods are super easy to use. Actually, I can even have the kids assist in the laundry chore. All you do is put the dirty clothes in the washing machine and add a Tide Pod. That's it. No measuring, spilling or adding too much laundry detergent. These pre-measured pods make my loads of laundry more streamlined. Second, my clothes are clean. No mom wants to re-wash clothes because grass stains and stink didn't come out in the wash. Even in cold water, the Tide Pods got my whites white, workout clothes fresh and football gear back to a wearable state. When I remove the grimy football pants and pads, I only smell a fresh, clean smell. No more sweat. Lastly, I like the idea that one laundry product can do it all. The Tide Pods are formulated to work in all temperature cycles, dissolving easily in cold water. Now I don't have to have several products to pre-treat, treat and re-treat. One compact maximum cleaning pod does the work of all those other products. 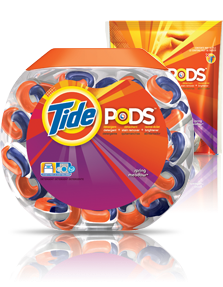 Tide Pods are available at many mass merchant outlets, grocery stores and other retailers. There are three available scents, Spring Meadow, Ocean Mist, and Mystic Forest. If you have some stinky laundry that needs to be tackled, put Tide Pods to the test. I think that you will be pleased with the results.